This great opportunity to pause and reflect has me thinking about dreams and the steps we take to move toward them…about how sometimes, when you take enough small baby steps, you pick up momentum, and find yourself soaring. I think the leap begins at the point that you have clarity about what you want to create in your life. It feels most real when you begin to see the fruits of the energy you’ve invested. The experience of leaping is like heading toward the edge of a cliff (yep, it’s scary!) and then, just as you reach the edge, you take flight. I doodled this morning and came up with this little model. Over the years I’ve written about many of the elements: dreaming, listening to your heart, being open, flying, having courage, learning, involving others, inviting perspective, seeking feedback, etc. 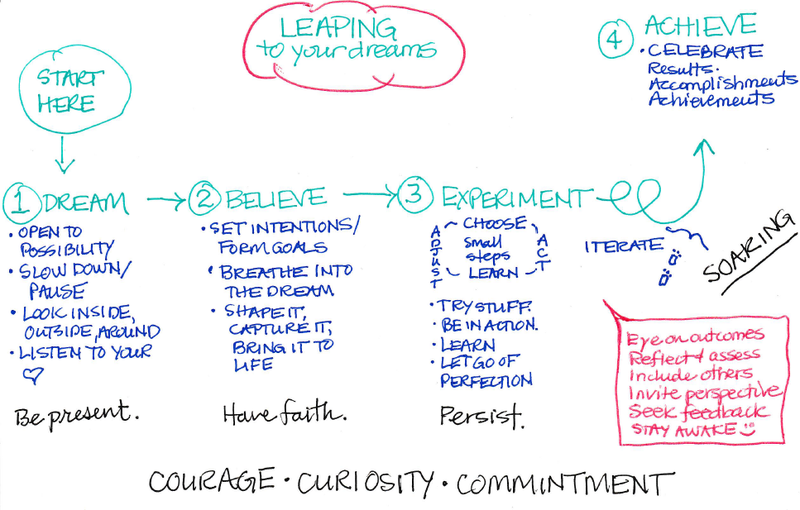 Hmmm…leading with intention and leaping toward dreams seem a lot alike! Sometimes leaping toward one dream pulls you in the very direction of your next leap. In the interview, I talk about the leap that was an outgrowth of my experience with breast cancer where I dug deep to understand my darker emotions through poetry and dared to be vulnerable enough to share what I discovered. That leap was the seed for the next leap, which involved consciously choosing to bring my heart and boldly embracing who I am at work. When I interviewed for my current job almost a couple of years ago, I remember the butterflies in my stomach as I told my would-be boss that she could count on me to bring not only my mind but also my heart to work. My workplace is a historically left-brained organization so pointing to this somewhat unfamiliar side was more than a little scary. Want to tune in to the leap you’re making? Carve out time over the next week, even a short 5-15 minutes will do to get started. Find a quiet place where you can sit alone. Start by doing nothing. Just sit, breathe, tune into your body. Become present in the moment, letting go of all the things you have to do. Create an opening for your dream and allow the possibility for it to appear. Just let the ideas ebb and flow. Embrace whatever comes, without judgement. A vision might not immediately take shape, and that’s okay. Just keep creating space and inviting your dream to come alive. Once you begin to have some clarity about your dream, describe what it looks like and how you feel about it. You can use the questions below to guide you. You may have your own questions – I invite you to share them here with us. You might focus on all the questions in one sitting, or you might take one at a time each day over the course of a week or two. Whatever works for you. The main thing is make time to be with your dreams. Play with them. Experience them. Listen to them. Feel them. Let them guide you. What is my dream? What do I want? Why is this dream important to me? What does leaping toward my dream look like? What commitments am I willing to make to see my dream come true? What small step can I take today to put my leap in motion? How can I summon the courage I need to spread my wings? Who can support me as I embrace my dream? When along the way will I celebrate how I am moving closer to my dream? Vicki, great post! Leaping can be scary. A metaphor I’ve heard my instructors use in life coaching training is to picture yourself diving into a pool. If you’re scared and look down and the water is clear and inviting, then that’s a feeling you’re on the right path. If you’re scared and you look down and the water is murky and uninviting, then that might be a sign to be cautious and rethink things. I love that metaphor and use it often to check in on if I’m “scared good” or “scared bad”. I think being scared in a good way is a sign you’re on the path of personal growth and change, moving towards your next personal best. Sunita, I love the pool analogy to determine scared good versus scared bad. I’ll try it! Thanks for sharing. Maureen, glad you like the model – really just a doodle. If I had any graphic design skills, I’d love to make an infographic! Maybe when I figure out what I’ might actually do with it, I’ll take it to the next level. I appreciate your maximizer and love how we learn from and grow with each other! 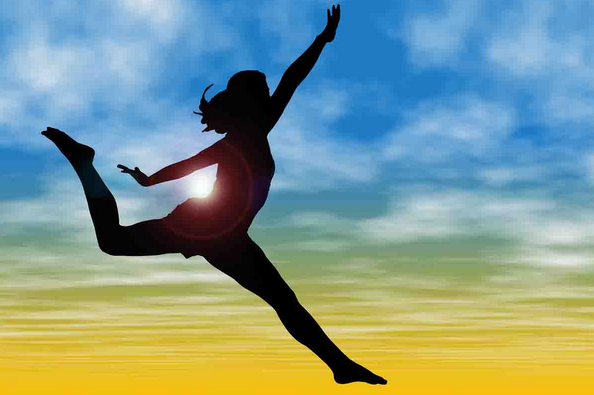 Thank you, Vicki, for writing such a wonderfully reflective post inspired by my LEAP! interview series which features women (including YOU) who aren’t afraid to leap in the direction of their dreams. I love how you spent some time reflecting on your big leap after our interview and then shared your ideas and thought-provoking questions on this blog. I hope others are inspired to LEAP! after reading or listening to your interview and will enjoy the other interviews in this same series. Wishing you the very best as you continue to LEAP! Next Next post: What is essential?